Tots are very popular potatoes. Have you noticed? They are a new side option in your favorite family restaurant and drive-thru. They are your kids’ favorite choice in the hot-lunch line. They top casseroles and hot dishes all year-round. And as fall rolls in and your weekend afternoons fill up with tailgating and game day gatherings, what about trying some cheesy topped ‘taters paired with a cool dipping sauce? First, bake your tots as directed on the package. You can easily adjust this recipe to match the size of your crowd. After you have the tots baked, here come the toppings. Toss your shredded cheddar (or any kind of cheese you like!) with some dry ranch dressing and bacon bits. Top your baked tots with the bacon-cheese mixture and throw it all under the broiler for 3 to 5 minutes. Make sure to keep an eye on it! 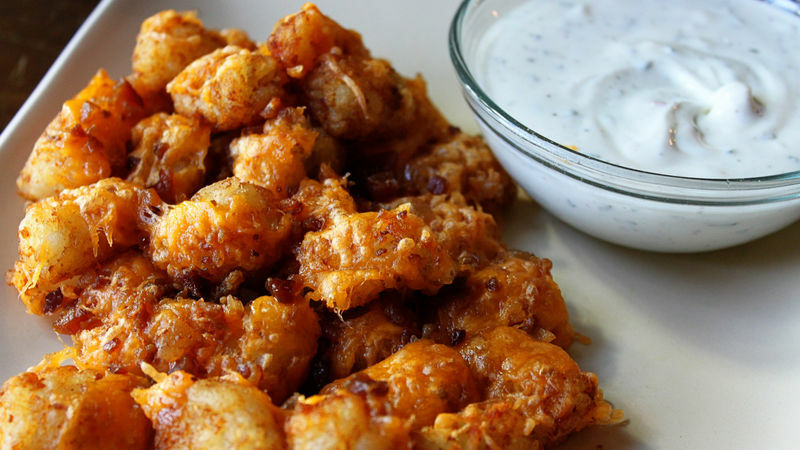 The dipping sauce is simple, just mix some plain Greek yogurt with a little more dry ranch dip. If you don’t have any yogurt around, you can always use sour cream. This dip is the perfect cool and tangy partner for the cheesy and salty tots.